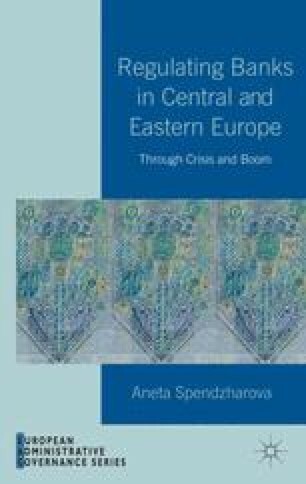 This book has investigated the choice of regulatory approach by banking sector supervisors in Central and Eastern Europe. Even though countries in the region received largely the same policy advice from international actors such as the IMF, the BCBS, and the EU, we observe variation in the regulatory approaches implemented during the credit booms in the early and mid-2000s. I sought to understand the domestic variables that influenced the choice of regulatory approach based on a most similar systems comparative case-study design. Bulgaria, Estonia, Hungary, and Slovenia are most similar systems with respect to their structural position in the global economy. As recent members of the EU, all four countries have been influenced by the common European regulatory framework in banking and finance. Yet the four cases offer variation in their banking supervision approaches over time as well as in important domestic variables such as economic reform path, bank privatization and level of foreign ownership, institutional structure of banking supervision, and party politics.